ICRC Restoring Family Links program. 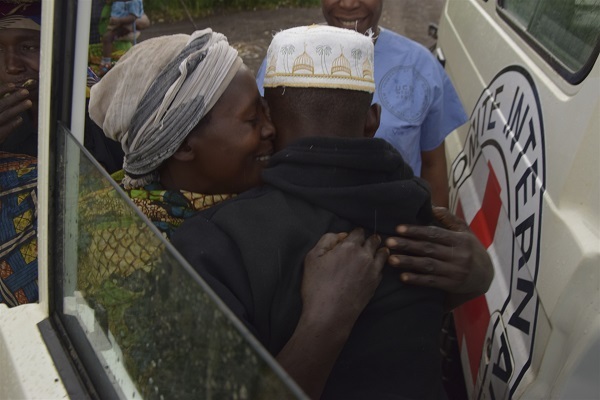 A mother hugs her son after arriving in their village with an ICRC team. They haven’t seen each other for four years. Due to the conflict in the Congo, each year many children are forcibly separated from their families and some are sent to serve as members of armed groups – violating international humanitarian law. 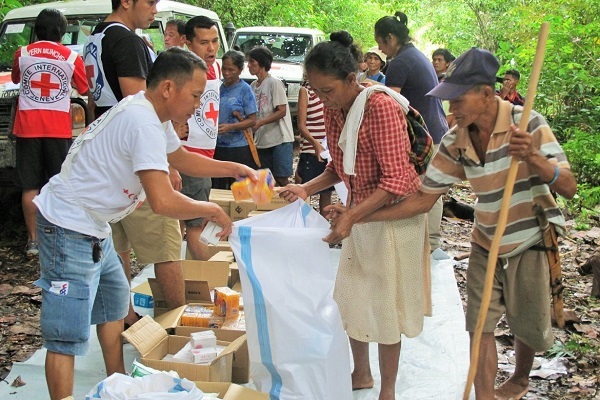 ICRC staff provide supplies to families in Surigao del Sur. Approximately 4,700 inhabitants were forced to flee their homes last year following outbreaks of violence. They returned to their homes only recently and they are trying to rebuild their lives. 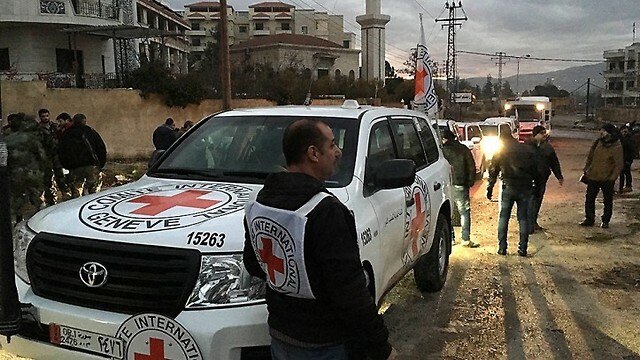 A convoy of the ICRC and the Syrian Red Crescent carrying foodstuffs, medicines and medical equipment, blankets and additional necessary equipment on its way to besieged residents in the town of MeDaya on the outskirts of Damascus. The civil war in Syria has lasted more than five years and has cost the lives of hundreds of thousands of people. 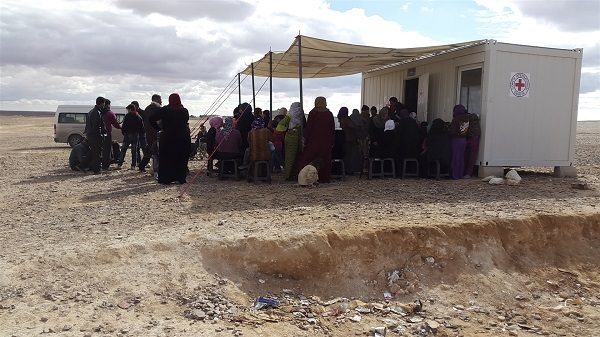 ICRC personnel are working in Syria to assist the local population. During the past year they provided medical treatments to more than a million people, food for more than eight million people and access to clean water to more than 15 million people. 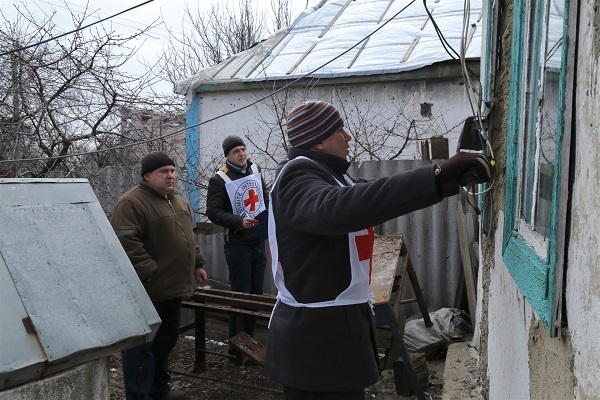 An employee of the Ukrainian Red Cross Society takes measurements of a damaged house in order to rebuild it – in cooperation with an ICRC employee from the Water and Habitat Unit. More than 8,000 people have been killed in the war that broke out in Eastern Ukraine in April 2014, following the revolution that ousted the pro-Russian President Viktor Yanukovych in Kiev and replaced him with a pro-Western government. 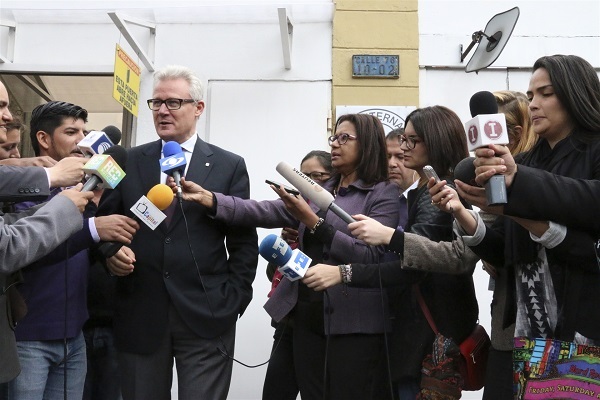 Press conference with Christoph Harnisch, ICRC Head of Delegation in Colombia. The day before, the Colombian government and the FARC reached an agreement on missing people, an agreement in which the ICRC took an active part. More than 100,000 Colombians who disappeared following the civil war are still defined as missing. 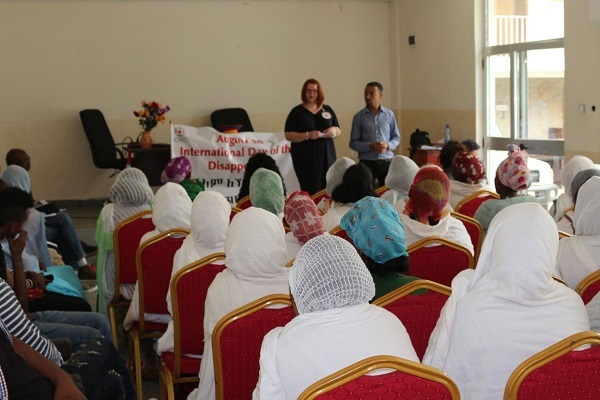 A conference organized by the ICRC on the International Day of the Disappeared, for people whose family members disappeared in the late 1990s during the conflict between Ethiopia and Eritrea. For three years a bloody civil war has taken place in South Sudan, which was preceded by decades of violence. 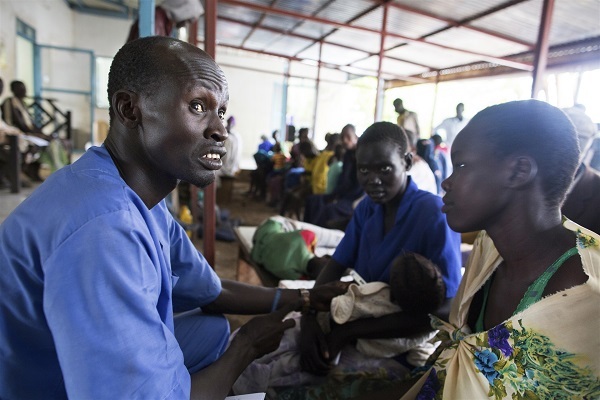 A nurse in a hospital supported by the ICRC assists outpatients in light of the difficulty of the country’s health system to function on its own. ICRC visit to a detention facility. With the approval of the detention authorities, an ICRC employee tours the entire facility, including the holding cells, washrooms, kitchen and clinic. 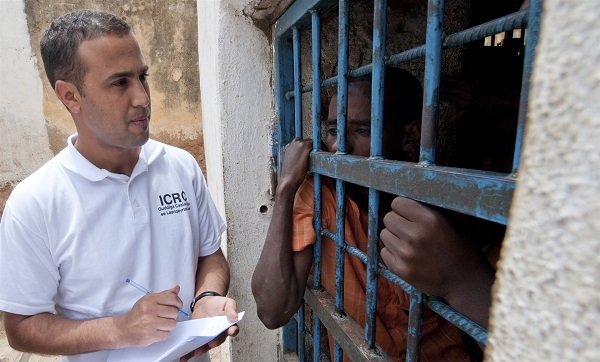 In the photo, an ICRC staff member interviews a prisoner, to ensure that he enjoys humane conditions and that he is treated with dignity. 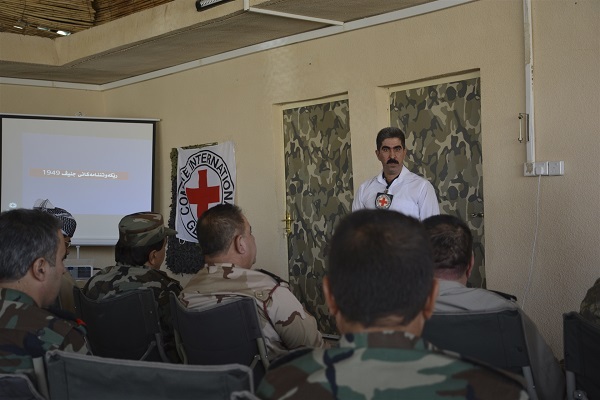 An ICRC representative explains the rules of international humanitarian law to soldiers, in order to reduce the human suffering caused by armed conflicts and other situations of violence. Photo: Virginie Nguyen Hoang / ICRC. Refugees fill their jerry cans with water in M’Poko Camp. Since December 2012, thousands were forced to fled the capital city of Bengui and leave their homes due to an outbreak of violence. 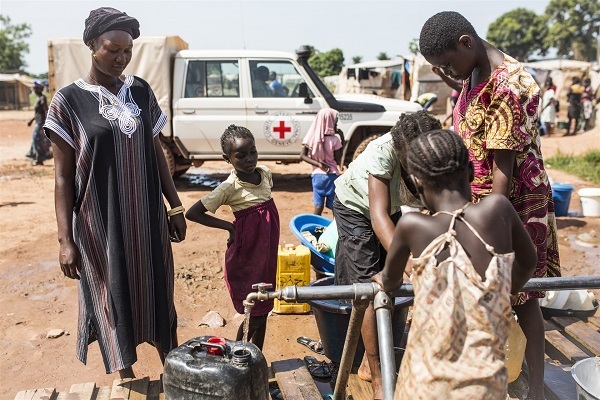 The CAR government, the Central African Water Distribution Company (SODECA), the Central African Red Cross Society and the ICRC offer assistance to internally displaced persons. The ICRC installed a water system with a capacity to hold 70,000 liters, distributed among 12 different tanks. 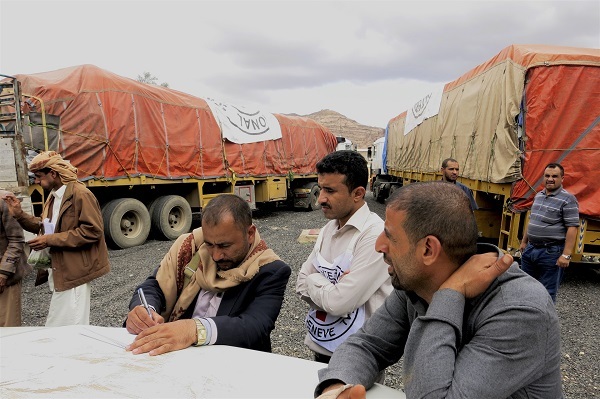 ICRC staff prepare food parcels in Yemen, where half of the populations has suffered from food insecurity over the past two years, since the beginning of the conflict. Apart from severe food shortages, many citizens of Yemen suffer from shortages of water, electricity and essential medical services. The ICRC was the first humanitarian organization, founded in 1863. Its legal mandate was provided by the State parties to the Geneva Convention. Its exclusive humanitarian mission is to protect the lives and dignity of victims of armed conflict and other situations of violence and to provide them with assistance. The ICRC is a private organization, founded by 196 states parties to the Geneva Conventions, including Israel. It operates with the consent of all parties taking part in conflict and conducts a direct and confidential dialogue with them, which ensures optimal access for the organization. In addition to the assistance in protecting people in situations of armed conflict or violence, the ICRC oversees and monitors respect for International Humanitarian Law by all parties to the conflict. If it identifies violations of the laws of war, it makes a confidential approach to the authorities responsible for the incident and conducts a dialogue with them in order to prevent future violations. The ICRC currently operates in over 80 countries worldwide. In Israel, the organization has been operating since 1948 and since 1967 it has had a permanent presence throughout Israel, the Golan, the West Bank and Gaza. The delegation’s offices are in Tel Aviv, Jerusalem, Majdal Shams, Hebron, Ramallah, Jericho, Nablus, Tulkarem, Bethlehem, Jenin, Gaza and Khan Younis.